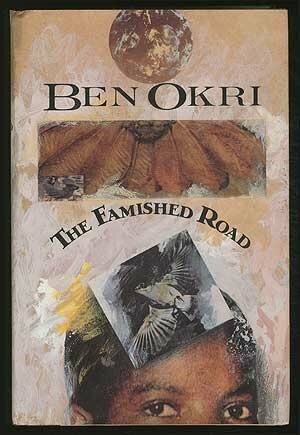 It’s been a while since I’ve read anything from my Booker Prize collection, so when Radio National chose Ben Okri’s The Famished Road (1991) for this month’s African Book Club, I decided to join in and resurrect my long-term The Complete Booker challenge. I wasn’t sure that I was going to like The Famished Road because the novel was said to feature magic realism, and I’m not very keen on that, but it turned out that I liked the book very much – and I’m not so sure that I agree with labelling the book that way anyway. After all, if a spirit world is part of an author’s world view (or his characters’ worldview) and these spirits intervene in the life of the characters, how is that different to a writer writing about people invoking the intervention of some other deity? Would we call it magic realism if an event in a novel were attributed to the intervention of a Christian or Islamic god? Azaro has been born and reborn many times, but this time, for reasons he is not sure of, he breaks the promise he has made to return to his companions, and decides to stay. Alas, Azaro’s decision doesn’t entirely bring his mother happiness. His spirit companions are very angry with him, and from time to time they put in a concerted effort to get him back, and this quest causes mayhem. Mum has plenty to put up with anyway, living in grinding poverty, with a husband who drinks too much and gets them into debt, and with little hope for the future except for her ambition that Azaro should finish school. With the help of a mendacious herbalist she fends off the spirits time and again, but she has less success with managing her husband. Directly or indirectly many of their troubles are caused by malevolent spirits, but the forthcoming elections add to their problems. Characters in the novel bemoan Independence as causing all the trouble and politics plays a big part in the story, but (apart from its publication date of 1991) there is not much to help date events. Wikipedia tells me that Nigeria gained its independence in 1960 but during the First Republic (1960-1979) the country was plunged into Civil War from 1967 to 1970. There was a Second Republic from 1979 to 1983 and a Third Republic from 1993 to 1999, with military coups intervening in between. (The Fourth Republic continues to the present day). But whatever the specifics of the time period might be, elections – and the political thuggery that accompanies them – bring violence, corruption and suffering to the ordinary people of the compound. Both The Party of the Rich and the Party of the Poor make promises that will never be kept, but The Party of the Rich has more resources to bully the people into voting for them. As Azaro’s father finds out when he goes looking for work, those who won’t commit to voting for The Party of the Rich get the worst jobs, for pitiful rates of pay. Dad is a stubborn man, and he is vociferous in his opinions, which gets him into trouble with his landlord too. Madame Koto, an ambiguous figure who runs the local shebeen, decides to align with the Party of the Rich and does very nicely out of it once she hires prostitutes to keep the politicians and their thugs happy. She is the first in the compound to get electricity and she even buys a car (though she can’t drive it). But Dad gets ever more degrading jobs and can’t seem to keep out of debt. Mum’s efforts to improve their lot with a stall in the market don’t work out, and she goes back to hawking her pitiful wares to bring in an ever-declining income. Things get really bad when Dad a.k.a. The Black Tyger decides to take up boxing again and his voracious appetite means Mum and Azaro often go hungry. There are also some disquieting scenes where his impotent rage results in a beating for his wife and child. I was a bit uneasy about the scenes of reconciliation and forgiveness between them, as I am disinclined to accept domestic violence as the norm in novels from any culture, and I’ll be interested to see if this issue comes up in the RN discussion about the book. It may sound as if The Famished Road is a dreary misery of a book, but it’s not. Azaro’s voice is upbeat and strong, and when he comments on the folly of his father and other adults, he does not judge them and his impudence is endearing. He sees his father treated like a beast of burden and he has compassion for him, but he also has a sense of humour about the crazy world he lives in. I think this is probably a love-it-or-hate-it book. If readers are prepared to enter into the world that Okri creates, it has much to offer, but some readers may dislike the hallucinatory sequences and the bizarre happenings in the spirit world. You achieved something that I failed at – I really couldnt get into this book at all and so its become one of the few Bookers that I could not finish. It just felt a load of mumbo jumbo to me…. It’s a while since I read The Famished Road, but I’m currently listening to Nnedi Okorafor’s Who Fears Death and I agree with you entirely about the racism inherent in the dichotomy between ‘our’ religions and ‘their’ magic/ paganism. Though I must say Sue (Whispering Gums) once – much more politely – pulled me up on the same point in relation to Alexis Wright. Prior to reading Okri the only novels I had read from this part of Africa were by Joyce Carey and Evelyn Waugh and the difference was eye opening – the difference between looking through a telescope and actually being there. There would still be many people who’ve never read anything by a Black author from any part of Africa, so it’s good that RN is running this club and widening horizons a bit. I am another who could not get through this book. I made it to 150 pages and I noticed it sitting on my shelf a few years on and know I won’t go back. I think it’s destined for the spring charity book sales. I did buy a very short book of his recently and I’ll give that a try when I have a chance. I am way off my African reading this year (I find it hard to imagine that you even sleep Lisa at the rate your reviews come out! ), even my shelf full of treasures brought back from South Africa has barely been touched. Seems this is my Spanish/Catalan/Portuguese year. Ah well, someone will find your book on the charity stall and bless you for donating it! Hi Kim, That’s a good point about Kim Scott, yes, it’s the same, it’s a case of the reader entering into the same world where mysterious things can happen. Not the same as those books where I get the impression that the author has used magic realism just to get out of a plot problem and it’s not grounded in the reality of the book and the culture of the characters. Hi Stu, you lucky man, how I would love to live in London and get the chance to see and hear authors like Okri!